This Wine Enthusiast 18-Bottle Wine Refrigerator review shines a light on an alternative to traditional wine coolers. This is particularly true for those wine connoisseurs who are inclined to include some collectible wines and vintages in their growing collection. Join us as we explore how choosing a wine fridge over a cooler can work out in your favor, giving you a more practical option for long-term wine storage. 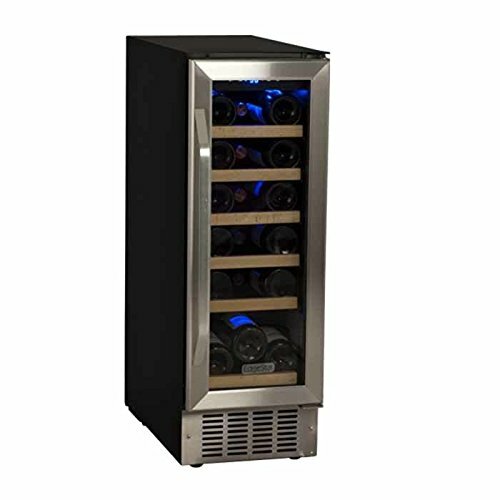 The major reason why wine enthusiasts prefer wine coolers over wine refrigerators is because generally wine fridges are built for practicality and longevity, but pale in comparison to wine coolers design-wise. That’s not the case with this 18-bottle wine fridge manufactured by Wine Enthusiast. It has a nice slender profile which makes it a great fit for even the narrowest of cavities in which you might want to put it. The LED interior illumination lights up your wine’s labels beautifully, with some of the light hitting the 7 chrome shelves and bouncing nicely off the stainless steel trim. The reflective smoky-glass door is also nicely trimmed with stainless steel, complementing the recessed door handle to radiate a very elegant-looking appearance. Since the cooling technology that goes into a wine fridge (in comparison to a good wine cooler) is built more for performance than anything else, it’s no surprise that this wine fridge weighs 52 pounds, despite its 18-bottle capacity. It also takes up space equal to a volume of 37.5” (H) x 9.9” (W) x 20” (D), so it’s slim enough to fit into very narrow surroundings. It’s a wine fridge but still uses thermoelectric cooling technology, so it’s free of CFCs and operates quietly (relatively) and efficiently. A right-hinged door opens up to a dual-zone cooling compartment that is illuminated by an effective interior LED light. 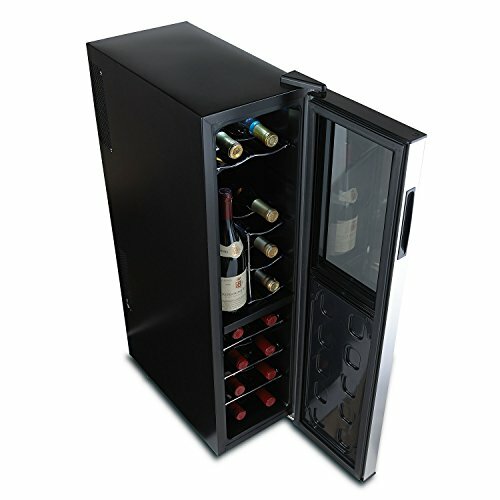 A touch-screen control panel allows you to keep an eye on and tweak the internal temperature at will and you get a one-year limited manufacturer’s warranty with this well-built wine refrigerator. In terms of fit (width), this wine fridge is unchallenged by way of the narrowest of channels it can fit into. The major pulling factor of this unit, however, is its tough build, which suggests that it would best be used for long term storage, which in turn suggests that you can store some of your vintage collector’s item wines. It doesn’t have a lock though so it would perhaps best be housed as more of a wine cellar would be, away from display areas where you can’t keep a regular eye on. The wide temperature range characteristic of both cooling zones means that you can also set the internal temperature to the perfect chilling temperature of both your red and white wines, keeping them ready for immediate decanting. A total of 10 bottles goes into the top cooling compartment, which operates within a temperature range of 54 to 66 degrees Fahrenheit. 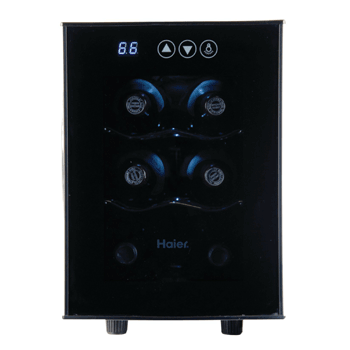 The bottom cooling compartment fits eight bottles and has a temperature range of between 46 and 66 degrees. Naturally, this suggests that your reds go in the top zone while your whites go in the bottom zone, but only if you want to set the storage temperature to a setting that keeps them chilled for decanting. You can otherwise store all your bottles (including vintages and collectibles) at a steady temperature of around 55-56 to just keep them from spoiling. For a thermoelectric-based cooling mechanism, this fridge is a bit noisy, but not to the point where you’d get irritated by it. A more important drawback of thermoelectric cooling to take into account though is the internal temperature’s relative reliance on the ambient temperature of the room the cooler is housed in. The fluctuations aren’t anything to make a scene about, though, but this does mean that you’d have to be strategic about where you place this wine fridge. Don’t put it in spaces that are prone to wild swings in temperature (like in direct sunlight or in overly-confined spaces). We found ourselves mulling over whether or not two separate doors would have been more practical for this dual-zone wine fridge but then suspected that might have hindered its design integrity and made it look a little less attractive. Completing this Wine Enthusiast 18-Bottle Wine Refrigerator review has us genuinely believing that wine lovers with some collector’s items should look no further than this unit. As a growing wine enthusiast, you undoubtedly come into possession of some keeper bottles which you don’t necessarily want to consume or finish any time in the near future. Judging by the high-quality build, performance and feature list of this wine fridge, we truly believe that this unit was purpose built for collectors with some vintage items they perhaps just want to store and show-off once in a while. The only argument against that notion though is perhaps the fact that this wine fridge doesn’t have a lock to keep your collectible vintages safely locked away.